This year the 29th annual recipient of the award was named. It’s Jake Abbott who happens to be a Fairmont native like Nickolich. Blue & Gold News has sponsored the Tommy Nickolich Memorial Award since 1991. The award is given to a walk-on player who sets himself apart from everyone else with his attitude and work ethic. The award is in memory of Tommy Nickolich, Fairmont native and former WVU football walk-on who played form 1979 to 1982 and passed away from cancer in 1983. This year the 29th annual recipient of the award was named. It’s Jake Abbott who happens to be a Fairmont native like Nickolich. Not only are they both from Fairmont, but both attended Fairmont Senior High School. Abbott is the first Fairmont Senior Polar Bear to be presented this award. He’s not the only Polar Bear on the WVU roster. Defensive linemen Dante and Darius Stills also attended Fairmont Senior. Before joining West Virginia’s program, Abbott starred at Fairmont Senior High School. While there was a two-time Class AA all-state selection. In 2016 he won the Chuck Howley Award, which is given to the best prep linebacker in West Virginia. Abbott is working hard on the field and in the classroom. He was named to West Virginia’s Garrett Ford Academic Honor Roll and the Big 12 Commissioner’s Honor Roll. 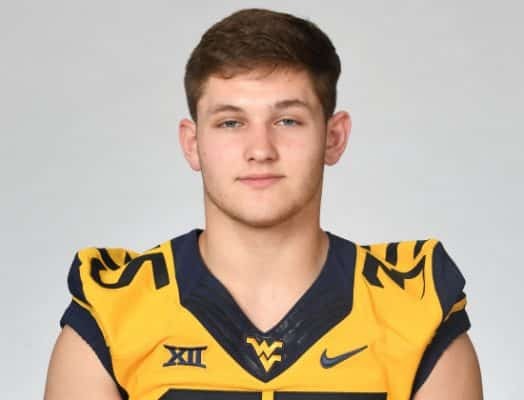 Jake Abbott, who continues to be a player mentioned by the #WVU coaches all spring as emerging at linebacker, has won the 2019 Tommy Nickolich Award given to a walk-on who has distinguished himself. Congratulations to Jake and great job excelling on the field and in the classroom.